(UPDATE: July 10 @ 1:45 p.m.) - The four Navy Seals that were coming out of the cave behind the last four boys and their coach have emerged safely. The Thai Navy Seal Facebook page posted a picture of the four men to their Facebook page with the caption, "all four Thai Navy Seals came out safely." In the photo, all four men have their thumbs up after a job well done, as they managed to get all 12 boys and the 25-year-old coach out safely over the last three days. (UPDATE: July 10 @ 6:30 a.m.) - It seemed impossible a few days ago, but there's been a happy ending in northern Thailand. All 12 members of a youth football team, along with their 25-year-old coach, have now been rescued from the Tham Luang cave in Thailand's Chiang Rai Province. The Thai Navy Seal Facebook page confirmed the news around 5 a.m. PT on Tuesday, shortly before 7 p.m. local time in Thailand. "We don't know if this is wonders or science or whatever, but the 13 wild pigs have come out of the cave," said one of the Facebook posts from the Thai Navy Seals. The final four boys and the coach are en route to join the rest of the team in hospital, where they are being treated in isolation. Three Thai Navy Seal divers and a medic are still on their way out of the cave. Messages of love and support have started to come in from people and organizations all over the world, including American President Donald Trump. "On behalf of the United States, congratulations to the Thai Navy Seals and all on the successful rescue of the 12 boys and their coach from the treacherous cave in Thailand," Trump tweeted. "Such a beautiful moment - all freed, great job!" Today's fantastic news ends a 17-day ordeal after the boys and their coach were trapped inside the cave on June 23. 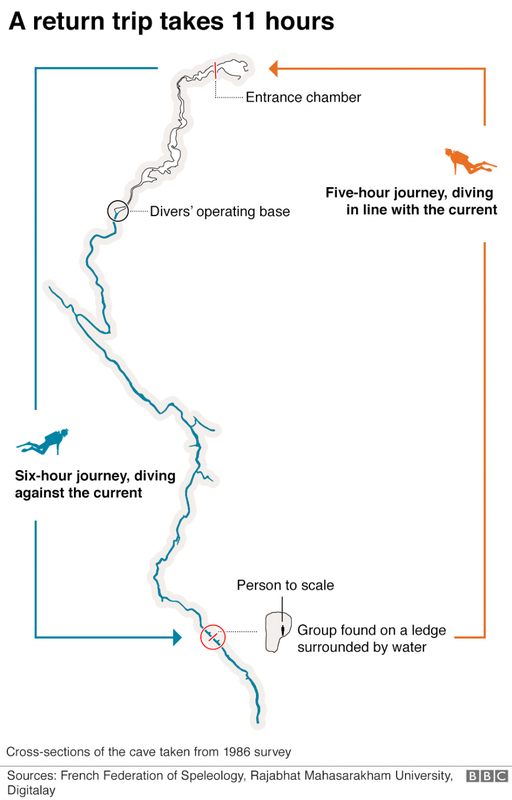 (Original story: July 9 @ 6:40 a.m.) - The mood is certainly changing around the flooded cave in northern Thailand where 12 members of a youth football team, and their coach, were trapped for more than two weeks. The Thai Navy Seal Facebook page has confirmed reports that eight of the boys have now been rescued. Four were extracted from the cave on the first day of the rescue operation, while another four were brought out on Monday. All eighth have been transported directly to hospital where they’re undergoing extensive testing. So we can confirm 4 boys out, chilled but safe today, 4 boys yesterday. 8 our of 8 - superb work. They will go back for the remaining four boys and the coach tomorrow. According to Jonathan Head, BBC’s Southeast Asia Correspondent, divers will go back for the remaining four boys and their coach on Tuesday. The rescue has made possible by cooperative weather over the last couple of days, which is expected to continue into Tuesday. It’s also been made possible by the efforts of former Thai Navy Seal Saman Gunan, who died delivering air tanks to the trapped boys last week in an effort to keep them alive. NowMedia will update this story as more information becomes available. Thumbnail photo courtesy of Getty.